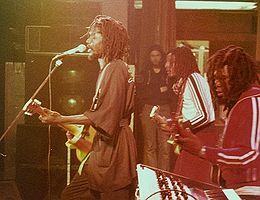 Peter Tosh (born Winston McIntosh, October 19, 1944- September 11, 1987) was a Jamaican reggae musican. He was a member of the Wailers with Bob Marley and Bunny Livingston. He was a Rastafarian and sang very political songs. His songs were a lot more radical than his friend, Bob Marley's, whom he often criticized for selling out to the white mainstream. He also toured with the Rolling Stones and sang a duet with Mick Jagger. He was murdered in his home in Kingston during a robbery in 1987. His biggest claim to fame was a song titled "Legalize It" in relation to marijuana laws. These are the highest rated compilation albums on Allmusic. This page was last changed on 18 April 2018, at 12:50.